This highly concentrated blend from Lo-Chlor is ideal for light and heavy infestations of black spot algae in all types of swimming pools. Use for the treatment of severe, resistant algae strains. Effective over a wide pH range, best results at pH between 7.0 and 7.2. At lower pH, the waxy coating surrounding algae cells is greatly softened, allowing easier penetration by chemical. A few facts from the professionals. 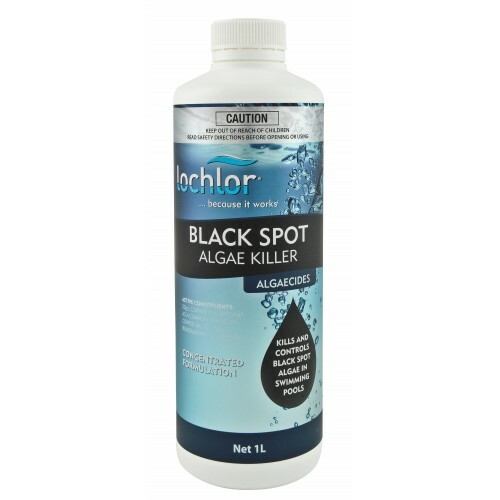 Concentrated Black Spot Algae Killer is a combination of the organo copper complex contained in Lo-Chlor Pool Algaecide together with the proven agent, Alkyl Dimethyl Benzyl Ammonium Chloride. Both are very effective anti-algae treatments. Combined they will overcome the most resistant of algae strains. As the compound suggests this blend contains ammonia. Note: High doses of quaternary ammonium compound may combine with free chlorine, resulting in excess levels of combined chlorine. This phenomenon lasts 2 or 3 days. Addition of Lo-Chlor Aqua-Boost is recommended if condition persists.